Home» AP LATEST UPDATES | AP School Management Committee (S.M.C) Election Notification and Scheduled and Guidelines » AP SMC Election-2016 Notification/Guidelines/Scheduled Download. 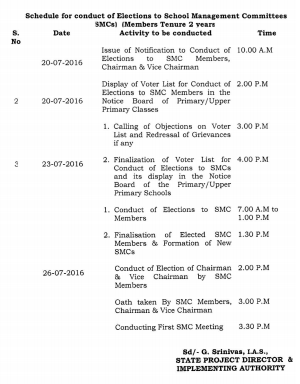 AP SMC Election-2016 Notification/Guidelines/Scheduled Download. AP School Management Committee (S.M.C) Election Notification and Scheduled and Guidelines for the Academic year 2016-2017 Download Andhra Pradesh SMC Committee Chairman and Members Teacher and Parents School Management Elections-2016 Notification and Scheduled and Guidelines Information Download. Sub: AP SSA Hyderabad CMO Guidelines for the conduct of SMC elections and Schedule Communicated Reg. Right of Children to Free and Compulsory Education (RTE) Act 2009. G.O.Ms No 130 School Education (PE ProgsJ) Department Dated:09 09 2011. G.O.Ms No 41 School Education (PE-SSA) Department Dated: 19-06 2013. I fumish here with the guidelines and schedule to be followed for the conduct of election of Chairman, Vice Chairman and members of School Management Committees in the Schools (except unaided private schools) in the State. I request you to issue instructions to the MEOs and HMs to conduct meeting of parents/guardians to constitute SMCs on 26.07.2016 positively. Get Download S.M.C Election Notification Guidelines Click Here.